How can we design Cherrywood to be a healthy, vibrant district? A new town is being designed at Cherrywood to provide housing for 20,000 people and workplaces for more than 10,000 employees, all clustered around the Luas line. Many of the homes are due to be completed by 2019 and in a time of severe housing shortage, this is very welcome. The developer applied in December for the first phase: the roads and drainage and the parks. The way we plan the transport for our city districts is directly linked with the future quality of life for the residents. So let’s try and get it right! In this post, I examine part of the road layout that the developer has proposed to find the good and the bad. Please let me know in the comments at the end what you think so that I can take your views on board when I make a submission to the council. There are only a couple of existing roads in Cherrywood: an access road to the M50 motorway and a road joining the residential area to the office blocks. Where these two roads meet is a vast roundabout which provides a soulless hole as the focal point of the district. There is no way to cross this roundabout on foot. By bicycle it is extremely hazardous. That’s because it was designed with just one goal: to maximise the volume and speed of cars passing through. The clear message to anyone using this junction is to always choose to drive. There are pretty coloured bike lanes on all sides which will be great so long as you are always turning left. Mmm, what happens if you want to go straight through the junction from the top right of this map to the bottom left? 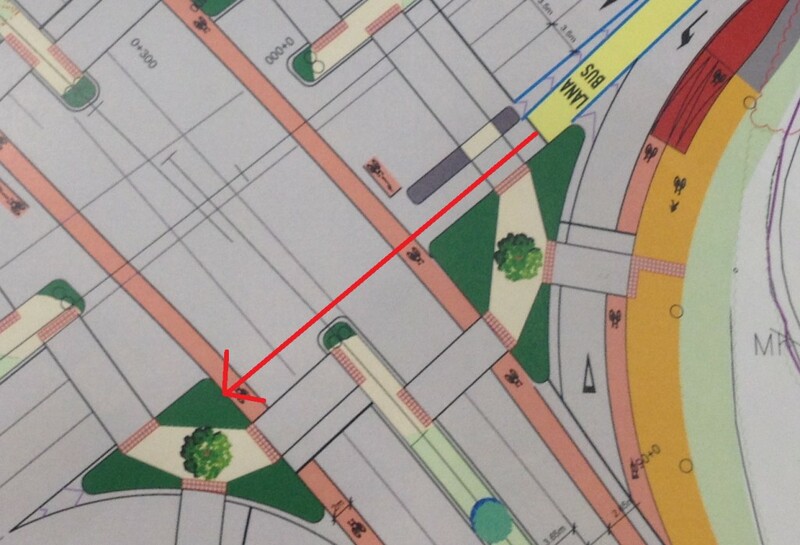 It looks like you would have to get off your bike and push through four separate crossings and three traffic islands. The problem is that we have a major motorway exit serving South Dublin passing through a future residential district. If it goes ahead as above it will divide the district and encourage future residents to drive for short local journeys. All of these approaches are in use in other countries so how do they look? Last year, I spent most of a week in the Netherlands studying how the Dutch get cyclists and pedestrians safely through junctions. I was accompanied by Irish road engineers while Dutch city officials showed us what had worked and what hadn’t in the past decades. 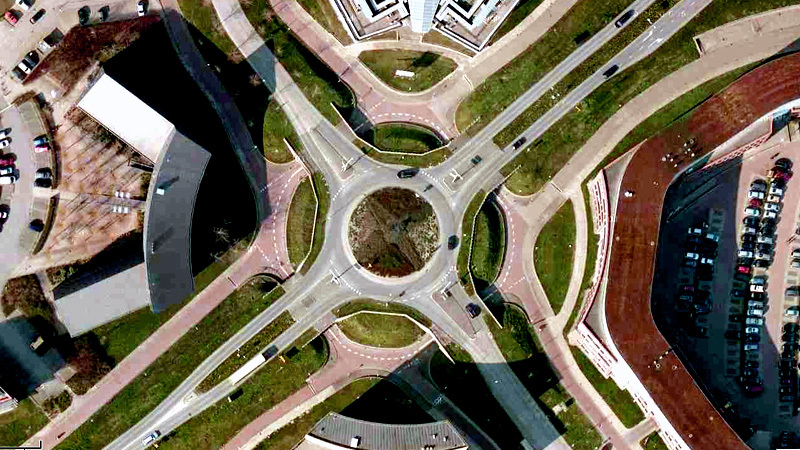 A normal Dutch roundabout is encircled by a separate bike ring. At each roundabout exit, there is a wide crossing for bicycles and pedestrians. Cars must give way to bikes and pedestrians when entering and exiting the roundabout and they really do! So, people on bikes don’t have to stop as they pass through a roundabout and they are separated from the circulating cars and trucks. Where they cross, the angle between the bikes and the cars allows for good eye contact between driver and cyclist. Sadly, Dún Laoghaire-Rathdown County Council (with the NTA) attempted to build such a bicycle friendly roundabout in 2011 in Killiney and made an utter hames of it. The design was dangerous and inconsistent with the above standards. There was no local consultation and utterly inadequate promotion and communication to other road users. After a few months of public opposition and at least one serious collision, the council decided to switch it back to the way it was and tell cyclists to use the pavement instead. The total cost of this outing was about €500K. The basic roundabout above won’t do in a place where there is a very high volume of vehicle traffic. So let’s look at what does work. Here’s a junction I visited in Eindhoven (home of PSV), called the ‘Hovenring’. Cyclists and pedestrians use a completely separate ring, floating above the road beneath and suspended by steel cables from a central pole. It cost about €6m to construct. 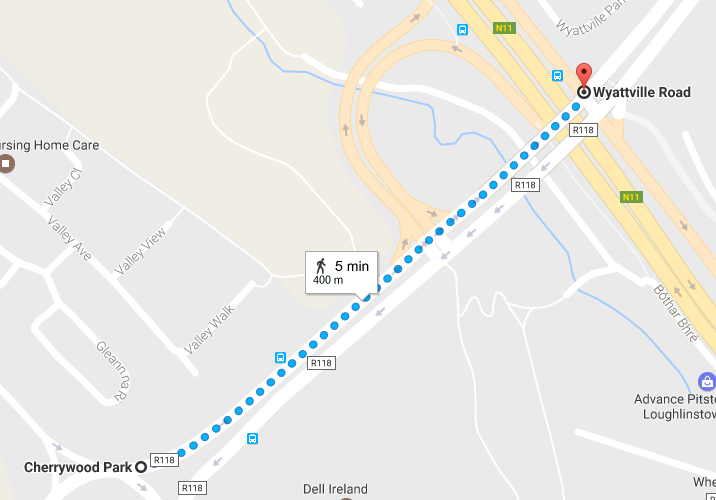 Given that the Cherrywood development will cost more than €2bn, this may not be an unreasonable amount. It is amazing and beautiful to see. 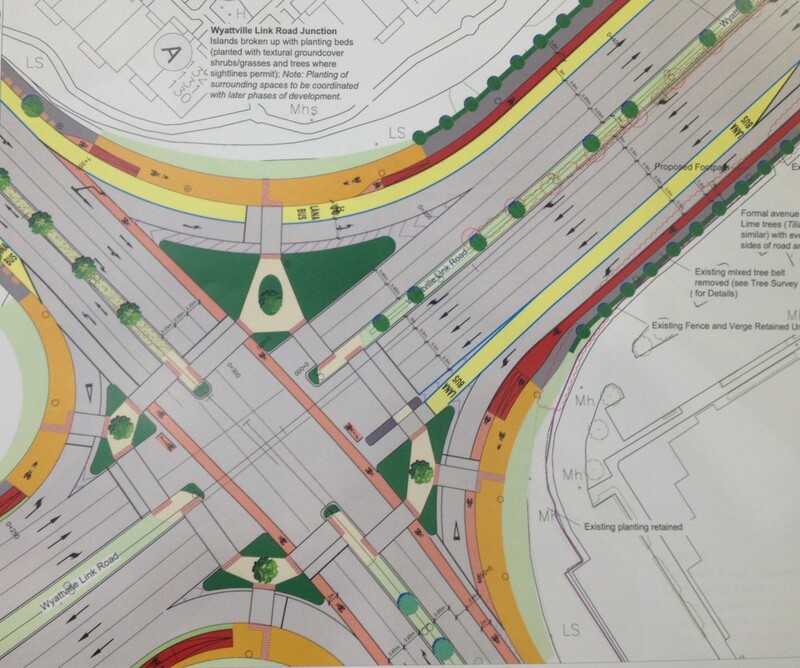 We could also raise the roads as they cross the junction and allow the bicycles and pedestrians to go underneath. I saw a good example of this in Houten near Utrecht. 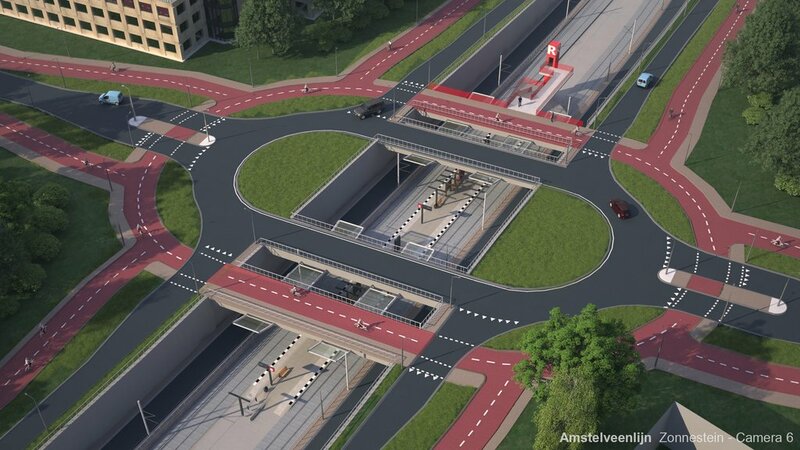 Here’s a planned junction in Amsterdam with the major road separated from the minor road and the bike lanes. This could be an answer for Cherrywood, with the motorway access road in a trench and the local roads at surface level. Twenty-five ways to get bicycles across a main road junction. 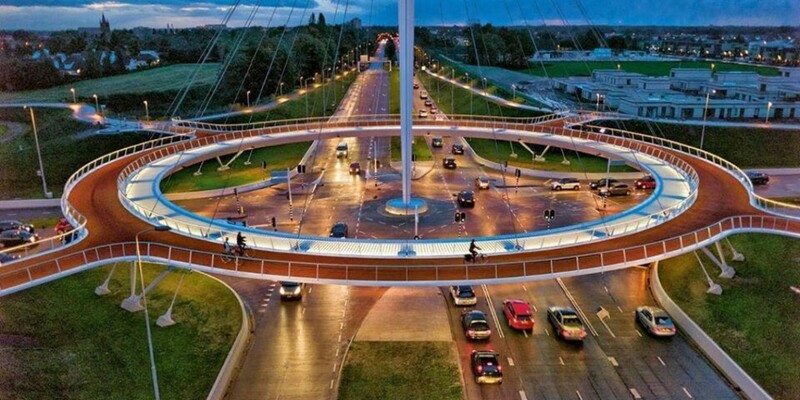 The Dutch town of Den Bosch has a ring road with 25 junctions, each of which may be safely crossed by bicycle. Here a video that shows that there are many different ways to do this – however none of them look like the Cherrywood proposal ! One of the goals of the Cherrywood new town is that the town will be laid out in such a way that people will choose to walk or cycle for most local journeys to the shop or to school. If we design the roads so that it makes more sense to always drive then, this goal won’t be achieved. Hi Ossian. Aesthetically elevation of the bike ring looks best but it would also expose cyclists and pedestrians to the full power of the Irish weather. It can be a pretty bleak and windy spot up there. Maybe well built short underpasses could work. ..the Dutch ones look good…need to avoid the negative / antisocial potential of underpasses… I once lived and cycled in Milton Keynes and there it was a case of building up as much speed and saying a short prayer before heading down an underpass! Are Cyclists allowed only to go one way around round about in Holland. They went both ways around the one in Killiney. At least only have to look one way for cyclist. 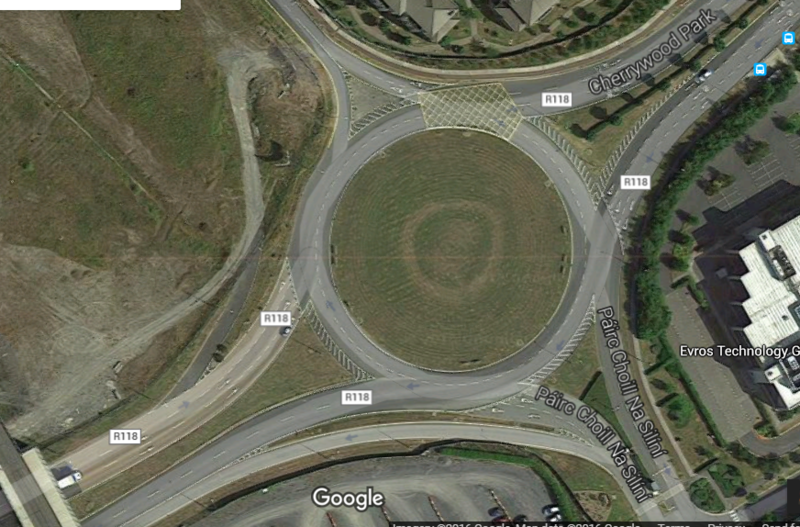 These roundabouts will not work in Ireland, hence the idea of junction controlled by traffic lights. Cycle lanes around roundabouts are often two-way in the Netherlands. The cycle ring is about 4m separated from the car roundaboout, so there is space for an exiting car to come to a halt and allow bikes and pedestrians to pass. Just one thing: What was tried at Killiney is not the equivalent of the bog standard Dutch roundabout shown — that might have worked a lot better there. 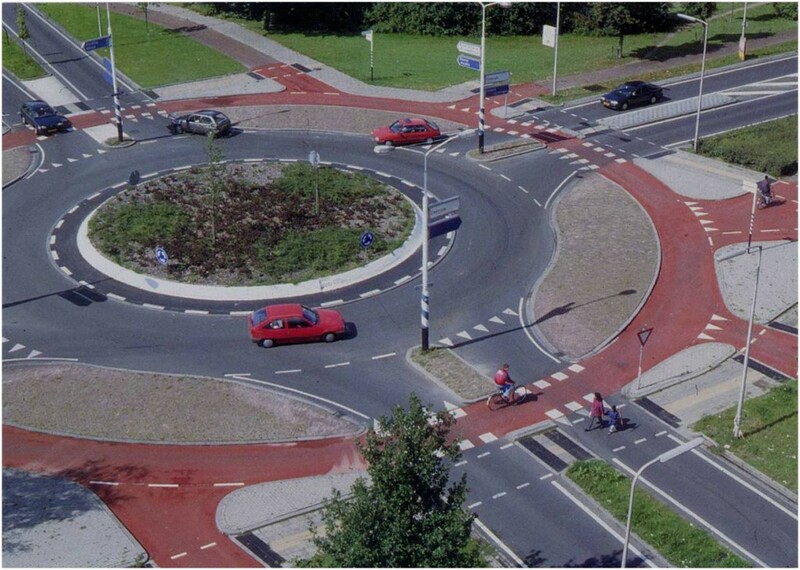 What was tried at Killiney is a style of roundabout design only used on much smaller roundabouts in the Netherlands. The Killiney project design even exceeded the max dimensions allowed for such a design in the Irish Cycling Manual. @ John Marks — Limerick City and South Dublin councils are “testing” cycling and walking zebra crossing at roundabouts and in both cases I understand that these are working well. The issues at Killiney were lack of clarity and lack of space between the motoring and cycling circles . Yes, Killiney Towers was not the equivalent of a bog standard roundabout. That’s why I said, “The design was dangerous and inconsistent with the above standards”. The Dutch made a journey from the place Ireland is at now, with cars ploughing through roundabouts, to their current norm where cars give way entering and exiting roundabouts. We are going to need a lot of road safety messages and driver education to make the same journey. In my opinion if this type of round about is introduced there has to be only one lane for cars on the roundabout and a very low speed limit introduced . In the clip of the round about in the Netherlands both the cars and the cyclists in particular are moving very slowly and treating everyone with respect. This will not not happen here. I don’t think I’ve ever seen such insight from a councillor in South Dublin before. Really interesting stuff. Excellent post. I would say you need to get those roads buried and pronto. It’s hugely anti social, including significant noise and air (particularly diesel) pollution. It will sever the community. There’s far too many lanes planned. I’m flabbergasted at how many they think they need. Once you build that in, it’s very difficult to take out later. It will induce car demand and make it harder again for locals to move through the area as a result. Overpasses and underpasses can work but usually are reserved for areas with less surrounding development, meaning longer run ups and run offs available to reduce the angle. By burying the road, you can keep crossing for locals at street level. The roundabout could even then be retained in some form as it’s more suitable to cycling with pedestrians and cyclists being able to traverse through the centre of it. It does appear developers have jumped ahead and decided to develop plans around the car. The area needs to have anchors like parks, low car roads and significant bicycle parking at the Luas so as to help to give context on the need to develop a high quality cycle and pedestrian links through the junction. Avoid any schemes that talk of maintaining the flow of vehicles. By current situation the traffic moves far too quickly though the area and needs slowing down. The effective way to do this is to reduce lanes and narrow them. Prioritising cyclists and pedestrians in junction design is the most significant step towards this. I really hope you’re successful in getting these guys to rethink their plans. Now is the time for action, retrofitting is very difficult to secure and is costly. You seem the man for the job though. Good luck! Thanks for the encouragement, Dermot. You r option 3 please. As per the comment from Dermot above busy, fast, through roads can tear a community apart and need to be separate from local traffic of all forms – foot, cycle, public and local cars and vans. Thanks for the interesting posts! I think number 2, “Elevate the major roads” is probably the best fit for Cherrywood. There is ample space on the approach to the roundabout from each arm whereby there could be a dip on the edges for pedestrians and cyclists and a ramp for the main carriageway. As it stands, most of the entrances and exits to the roundabout have a whopping three lanes and even a fourth slip lane which is gross over-provision for cars. This excessive space could easily be utilized for the installation of a two-way cycle track the entire way around and a pedestrian walkway. The Design Manual for Urban Roads and Streets (DMURS) frequently uses the phrase ‘desired lines’. If this were to become a double-decker roundabout as per suggestion number 2, an additional x-shaped diagonal crossing could pass beneath the carriageway. 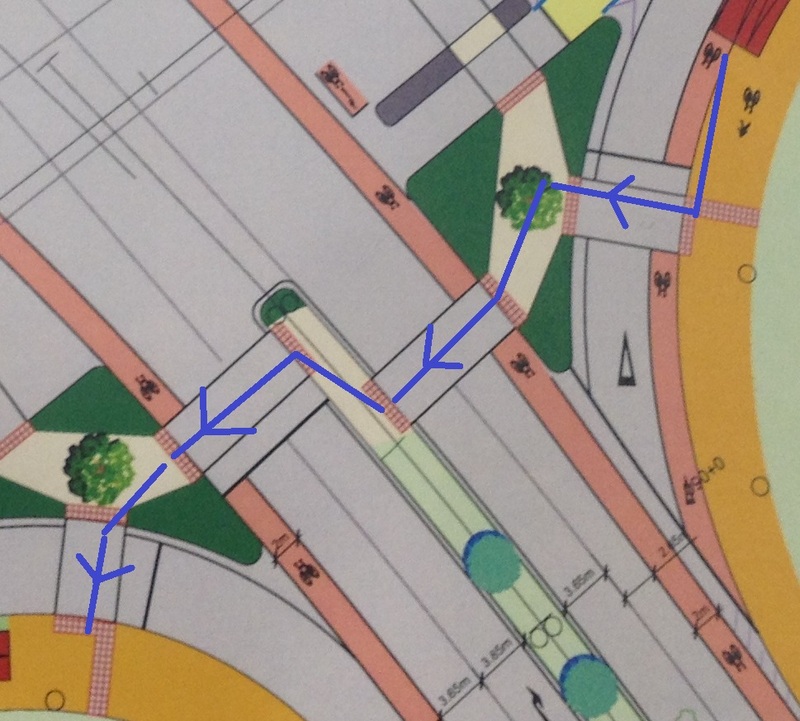 This would accommodate a 2 way cycle track and pedestrian walkway to save time in crossing the entire circumference. This should help meet the requirements of the ‘desired lines’. would be there in part to ward off any anti-social behavior which traditionally materialized in less exposed underpasses. For motorists, the above would mean a roundabout with a constant 2 lanes on approach, exiting and on the actual roundabout itself. 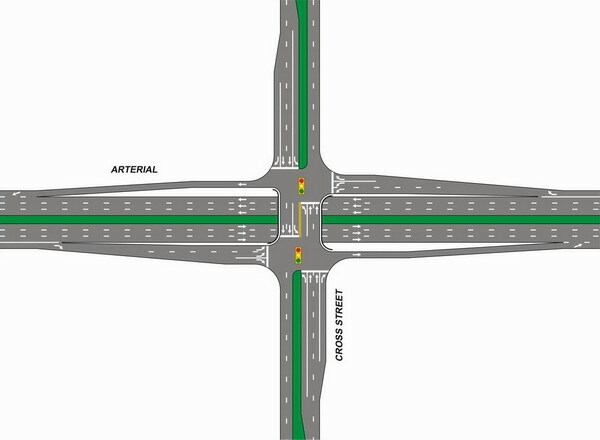 The official proposal of a signalized crossing to replace the roundabout is extremely hazardous and inconvenient for cyclists and pedestrians. It’s somewhat akin to the situation at Westmoreland Street where one has to battle their way across a whopping five lanes of traffic in parts. For cyclists who don’t want to be side-swiped, this means dismounting from their bike and negotiating their way across a minimum of three traffic islands (if they intend on crossing only one of the 4 roads). Conversely, “A bog standard Dutch roundabout” would be a massive sacrifice for motorists as it would likely result in horrendous tailbacks propagating all the way to the M50. In short, too much provision for the car at the expense of cyclists and pedestrians leaves them marginalized and makes for soulless infrastructure. Too little provision for motorists in favor of cyclists and pedestrians would, in this case cause massive tailbacks possibly, stretching back to the M50. In conclusion, a perfect balance needs to be achieved where ALL road users are happy and I strongly believe that number 2 is it. I had a chance today to read the observations today from the National Transport Authority (NTA) and from Transport Infrastructure Ireland (TII). They both agree that this solution is inadequate and suggest that the developer go back and redesign it. I have a meeting with the planners on 1st Feb and I will put this case on the agenda. The Dun Laoghaire County Council website is really difficult to navigate, is there anything you can do about that? Thank you keeping people informed. Thanks Sergio. The council website is hard to navigate and yet there is a lot of good information hidden there. I will ask the executive in charge to sort it out. 1. Permission has been granted for the road network according to this link. 2. Coverage of the same can be seen at The Journal. According to the coverage in The Journal, construction work should begin in the next few weeks. It should be interesting to see how traffic fares from the M50 when the new signal controlled junction is completed. The construction of the road network is earmarked for completion in 2017 which is somewhat optimistic for (circa) 5 kilometers. Either-way I look forward to trying it out in its entirety. One of the roads (to be used by buses) is going to be laced with chicanes which I am very reserved about. I’m surprised that this hasn’t been in the Weekly Traffic News from the Dun Laoghaire-Rathdown County Council website. However, for the past few weeks, it looks like construction on the new road system is already underway. Apparently, major road works are to begin from the 30th of January according to the road information systems in the vicinity. Along Valley Drive, there appears to be a lot of flattening of the once uneven mud patches which I imagine is for the purpose of the road widening that is to take place there. Next, towards the M50 on the right, you have an enclosed construction site where they seem to be restructuring the land at the junction where the mobile speed camera check points are occasionally stationed. Finally, there has been a lot more information added to the official Cherrywood Dublin Website where you can even find blue prints of the town center that will be built on the R118. In any case, I am really looking forward to when the whole thing is complete. The roads now have permission and are being built. The major junction that I wrote about in this post has been redesigned to make it a little easier to cross – but not by much. Overall, the district is still planned with large volume roads and junctions aiming to maximise throughput of vehicles rather than throughput of people. I am disappointed but you can’t get everything you want. The developer says he wants it to be like Ranelagh – but if he gets it wrong I think it will be another Adamstown. Thanks for drawing my attention to the new draft designs on the web site. None of these have planning permission yet, but the process is swift. As a daily cyclist commuter, from Cherrywood to D2, I wouldn’t dare cross the current roundabout and that is before there is additional town centre traffic and residential units. At present, an easy stop gap solution is to make a cycle path with a contra flow lane on the Cherrywood side after you cross over the Loughlinstown fly-over. I already choose this route, I would prefer for it to be legitimate lane but I have no other choice at present as it is far too dangerous to attempt that roundabout. I am a cycling in town every day and once you get to Cherrywood is the most dangerous part of my journey, it is def. not child friendly, if you wanted to encourage kids to cycle to school! Also, I wanted to note that last night there was roadworks happening WELL after midnight , correct me if I’m wrong but that is not illegal? Scraping of metal diggers and beeping of reversing dumper trucks at that time is not appreciated by the current residents who need to live with this building site over the next 4-5years. If you have any advice on best complaints procedure please do let me know. You must be very fit with that kind of a round trip every day! Good for you. is this the location that you would like to see a contra-flow? Monday to Friday: 8 a.m. to 7 p.m.
Saturdays: 8 a.m. to 2 p.m. I had a look through the planning conditions attached to the grant of permission and I don’t see any changing these hours. I have lodged a complaint with the planning enforcement section of the council to request that the matter be inspected and the developer served with a formal warning. Thanks for your response. We logged the noise incident with the apartment management company also. It seems the council can do essential maintenance outside of the normal agreed construction hours. They are investigating if that was the case. Hopefully it was a once-off and won’t be a very regular occurrence. We are really looking forward to the new development but just want to be sure that we can get some sleep over next 4 years! All the plans look great and we’re supportive of the development efforts. There is also a pedestrian path that could be widened to allow for cyclists that might help. But there are some older trees there that probably take preference. Some additional lighting there might make the pathway a little safer, it is very dark and desolate along the path.